Globalisation stirs a diverse range of sentiments and views: some credit globalisation for boosting economic well-being while others blame it for worsening inequality. This column examines the effect of globalisation on income among and within countries, and shows that globalisation is associated with income convergence across countries and income divergence within countries. Targeted redistributive policies and investments in education are needed to ensure that the benefits of globalisation are enjoyed by all. On few economic developments of the recent decades are the sentiments so diverse as they are on globalisation. Some credit globalisation with boosting economic well-being and reducing poverty. Others blame it for leading to appallingly high levels of inequality, benefitting a few, while leaving many behind. These recent trends have supported the political backlash against globalisation (Rodrik 2017). The future of globalisation, it currently seems, depends to a significant extent on the question of how the gains from it are distributed. Recent research has provided an enormous wealth of fine-grained data on income gains over the past decades, a period in which many countries reached unprecedented levels of integration in the global economy. We now know that middle classes in emerging economies like China are among the big winners of this era, while lower classes in many advanced economies have not seen substantial gains (Milanovic 2016). At the same time, top incomes in many countries have risen dramatically and high levels of inequality are widespread (Alvaredo et al. 2017, Piketty 2014). These trends are well documented (World Bank 2016). But are they direct results of globalisation? When investigating how economic globalisation affects incomes, it is important to note that countries still differ substantially in how strongly they are integrated in the global economy. The ‘KOF index of economic globalisation’ — a widely used measure that combines eight of the most prominent indicators of economic globalisation to a multidimensional index — illustrates this (Figure 1). Most developing economies are still far from the levels of integration that most advanced economies have reached. But while globalisation in average high-income countries have stagnated or even declined in some (see also IMF 2016), the process of economic integration in most low- and middle-income countries is still in full swing. 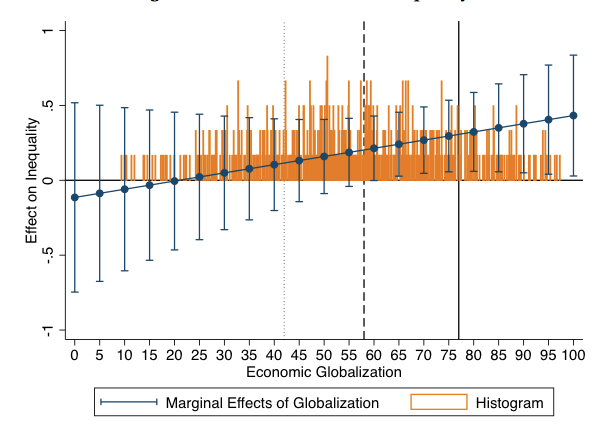 Theory suggests that the effects from globalising may differ across countries with such diverse levels of globalisation (e.g. Rodrik 2011). Notes: LIC: low income countries; LMICs: lower middle income countries; UMICs: upper middle income countries; HICs: high income countries.The figure shows the unweighted cross-country average of the “KOF index of economic globalisation” for each income group and year. The index captures the extent of cross-border economic flows as well as the absence of legal restrictions to such flows (Dreher 2006, KOF 2016). In our recent work, we link these trends in globalisation withthe most recent data on income dynamics around the globe (Lang and Tavares 2018). To identify differential income gains for the global population in a fine-grained yet comprehensive way, we combine various data sets on income levels, income inequality, and income growth by decile. We arrive at a panel of almost all (non-microstate) countries for almost half a century (147 countries in the 1970-2014 period). Our empirical strategy to identify the effect of globalisation on incomes exploits the finding that globalisation diffuses geographically over time. We show that the globalisation levels of geographically close countries are strong predictors of a country’s globalisation level in the subsequent period. Similar to Acemoglu et al. (2017), who apply a related concept to identify the effect of democracy on incomes, we use this (temporally and spatially lagged) measure as an instrumental variable in dynamic panel regressions of income dynamics to circumvent the endogeneity problem. Our results show that economic globalisation increases many but not all incomes. The effect of globalisation on average income growth crucially depends on a country’s prevailing level of globalisation. While globalising is generally good for growth, there are diminishing marginal returns. The growth gains are substantially positive for countries at early and medium stages of the integration process; while for countries at very high stages of globalisation, income gains are small or insignificant (Figure 2). As a result, less-globalised countries, usually low- and middle-income countries, can still expect large gains in average incomes when continuing their integration in the global economy. For the most globalised advanced economies, further integration is less likely to come with substantial growth gains. Notes: The figure visualizes the result of our baseline growth regression. The blue line depicts the average marginal effects (and 95 percent confidence intervals) of a one-point-increase in economic globalisation on a country’s five-year growth rate depending on a given level of economic globalisation. 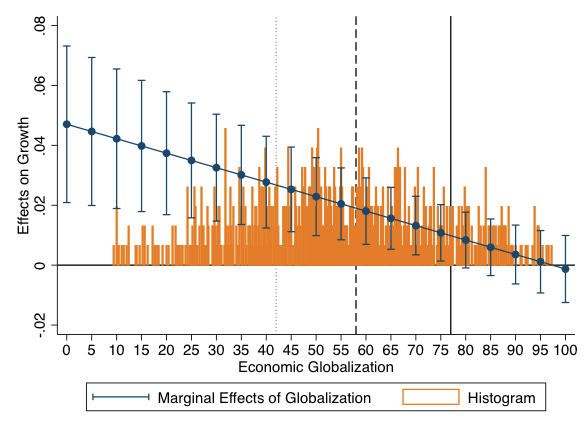 A histogram of the distribution of globalisation levels across the sample is shown in orange. The three vertical lines indicate the current average level of economic globalisation in LICs (dotted), MICs (dashed), and HICs (solid). When going beyond country means and examining how the gains from globalisation are distributed within countries, we find that economic globalisation has indeed contributed to increasing income inequality. The evidence suggests a substantial impact on the Gini indices of market and net income. The effect is particularly significant in countries that are highly globalised (Figure 3). To identify the winners and losers of globalisation, we then look at gains by income deciles. This analysis shows that on average globalisation comes with substantial income gains for those at the top of the national income distributions. The incomes of the poor, however, are barely affected, neither positively nor negatively. However, trends in developing countries are different: these economies enjoy higher income gains and a stronger poverty-reducing effect. Notes: The figure visualizes the result of our baseline inequality regression. The blue line depicts the average marginal effects (and 95 percent confidence intervals) of a one-point-increase in economic globalisation on a country’s five-year average of the Gini index of net income depending on a given level of economic globalisation. A histogram of the distribution of globalisation levels across the sample is shown in orange. 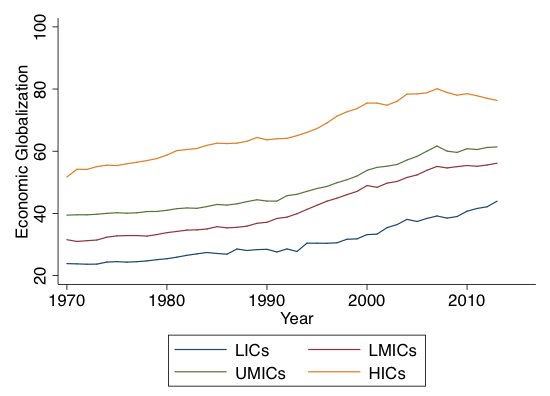 The three vertical lines indicate the current average level of economic globalisation in LICs (dotted), MICs (dashed), and HICs (solid). In sum, the evidence suggests that globalisation leads to substantial income gains, which are distributed unequally both acrossand within countries. Globalisation is associated with income convergence across countries and income divergence within countries. These findings point to the importance of globalisation in explaining the fact that global income inequality is less driven by differences in income levels between countries, and increasingly by within-country inequality (World Bank 2016). The bad news is that in many countries, globalisation in its current shape may not be an inclusive process. The good news, however, is that globalisation increases average incomes, and the rise in inequality is due to the concentration of gains at the top, suggesting that distributive domestic policies can make globalisation more inclusive. When taking domestic policies into account, the evidence suggests that redistributive taxes and transfers are able to mitigate the distributional consequences of globalisation. Especially in many European countries, where they already play an important role in cushioning the adverse distributional effects of globalisation. In most low- and middle-income countries, however, tax and transfer systems are of a significantly smaller scale, implying that larger policy reforms are needed to make globalisation more inclusive. While taxes and transfers are an effective tool for countering the inequality-increasing effects of globalisation, they do not offset the entire rise in net incomes’ inequality. Important complementary policies can prevent inequality of marketincomes from rising. Education has a crucial role to play in this regard. Consistent with previous findings, higher education levels are robustly related to lower inequality in our data (De Gregorio and Lee 2002, Goldin and Katz 2010, OECD 2011). 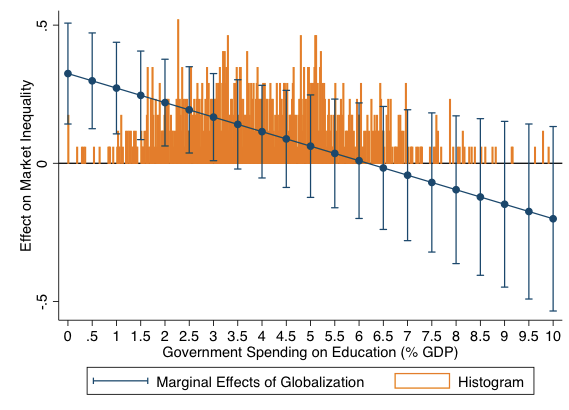 And when focusing on developing countries, the association between globalisation and inequality becomes weaker when governments invest more in education (Figure 4). We interpret this as evidence that education policy has an important role to play in enabling societies to reap the gains from globalisation in an inclusive way. Notes: The figure visualizes the result of a regression of market inequality in developing countries. The blue line depicts the average marginal effects (and 95 percent confidence intervals) of a one-point-increase in economic globalisation depending on a given level of public spending on education (% GDP). A histogram of this variable across the sample of developing countries is shown in orange. In conclusion, many countries have much to gain from economic globalisation. Policymakers, however, should be aware of the trade-offs: globalisation tends to increase both income growth and income inequality. Especially for countries reaching high levels of globalisation, the additional growth gains can be low while the distributional costs can be high. But policies matter. Without combining the process of economic integration with policies that allow the gains from globalisation to be more broadly shared, globalisation is likely to leave many behind. Targeted redistributive policies and investments in education can steer globalisation into a powerful force for generating income gains for all. Authors’ note: The views expressed are those of the authors and should not be attributed to the institutions with which they are affiliated. Acemoglu, D, S Naidu, P Restrepo, and J A Robinson (2017), “Democracy does cause growth”, Journal of Political Economy, forthcoming. Alvaredo, F, L Chancel, T Piketty, E Saez, G Zucman (2017), World Inequality Report 2018 , World Inequality Lab. De Gregorio, J, and J-W Lee (2002), “Education and income inequality: new evidence from cross-country data”, Review of Income and Wealth 48(3): 395–416. Dreher, A (2006), “Does globalisation affect growth? Evidence from a new index of globalisation”, Applied Economics 38(10): 1091–1110. Goldin, C, and L F Katz (2010), The Race between Education and Technology, Belknap Press. IMF (2016), “Global Trade: What’s behind the Slowdown”, IMF World Economic Outlook 2016 . KOF (2016), KOF Index of Globalisation , ETH Zurich. Lang, V F and M M Tavares (2018), “The Distribution of Gains from Globalisation ”, IMF Working Paper 18/54. Milanovic, B (2016), Global Inequality: A New Approach for the Age of Globalisation, Harvard University Press. OECD (2011), Divided We Stand: Why Inequality Keeps Rising,  OECD Publishing. Piketty, T (2013), Capital in the Twenty-First Century, Belknap Press. Rodrik, D (2011), The Globalisation Paradox, Oxford University Press. Rodrik, D (2017), “Populism and the Economics of Globalisation ”, CEPR Discussion Paper 12119. World Bank (2016), Poverty and Shared Prosperity 2016: Taking On Inequality , World Bank Group.